Yarn or Death was very happy with the first installment of her yarn. And it's still so shiny and pretty, I'm still a little surprised considering how hard the roving felt. Here it is sitting on my messy desk at work. YoD is traveling tomorrow and is all excited about the number of hours in the car - knitting time, don't you know. Tonight will be an Ash Ketchem junk food festival -- yay! -- the start of overeating season has arrived. It's been really cold down here this week, which I love, being from a cold place. 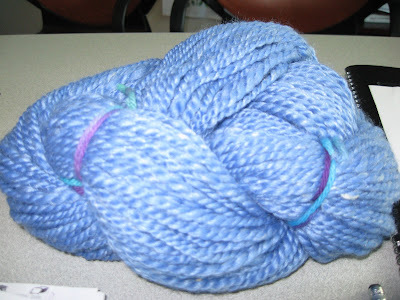 While I plan to ply the blue silk/merino tonight, I may or may not have a picture of it to show before going to bed. But I did get all 8 oz. spun up last night. So, a random thought from the past weekend - Apple Crisp. (Note, we made on big one, cooked it for 40 minutes, used Granny Smiths and Macintosh apples, added a dash of ginger, nutmeg and cloves to the apples, and a full stick of butter for the topping.) We generally try to roll out some new dish in our house every other weekend or so when the weather gets cold, this one was a keeper. Thanks to Lori for inspiring me to share that one. Funnily enough, I usually have trouble getting colors to come out as vivid and bright as they are in real life in my pictures. Tonight, the spinning is shining through. Must be the silk, I guess. It's so nice and soft, I want to get it all spun (8oz. really shouldn't take long) and see how it looks when plied. Hopefully I'll remember to ask YoD tomorrow whose roving this is so I can give them proper credit. On the topic of 2 great tastes that go great together? Silk and wool! Yarn or Death went to SAFF and had a great time. I'm jealous, because I miss going to things like the NH Sheep and Wool Festival. Raising sheep and other woolly things this far south seems, well, kind of mean to me as it's so hot. But anyway . . .
Before she was leaving she asked if I ever spun with non-animal fibers. 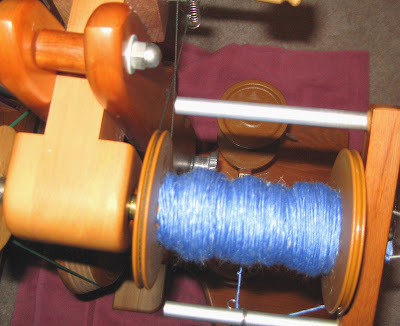 I explained my spinning is really good enough for me to have ventured into cotton, hemp, stuff like that. But I'm not as dense as I look, so I said "if you see anything at SAFF that you really like, feel free to buy it and I'll spin it for you - unless you want to do it yourself." YoD isn't ready to start spinning, but I now have 8oz. each of silk/merino blend in summer sky blue (2 oz. of which I spun last night while watching the Colts and Titans) and some chocolate brown alpaca. Before (15 years ago - that's scary, when did I get so old?) I'd worked with silk, but it was in brick form, and I got very frustrated and decided I hated silk. I'll post pictures of that silk/merino tonight. Maybe I can haul the wheel out onto the porch before the light goes away. The pre-drafting is different than straight wool - the silk gets really smooshed down sort of locked together, so after pulling the roving into quarters, I then find it works best to fluff it out from the side, turn it 90 degrees and fluff it again. The roving goes from hard, squeaky and dense (do you know what I mean about silk fibers being squeaky?) to soft and cloudy and suddenly very shiny. So, what's worse that suddenly discovering your taste for something wickedly expensive like silk and wool roving? Finding someone else insane enough to fund your problem. Even YoD saw the danger here. Night pictures don't show colors very well, especially not these blues. But I'll try and get one in daylight. I'm thinking of calling this one "Frost Flowers". And we carved our pumpkin this afternoon. We stopped by the courthouse down town to see what the local schools had done to see if we could get inspired. 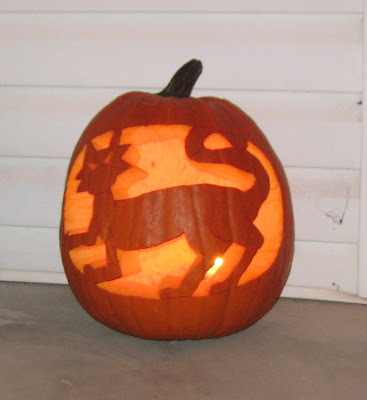 The pumpkin design was the little one's idea, start to finish (I just work here). Snow with shadows is the colorway. 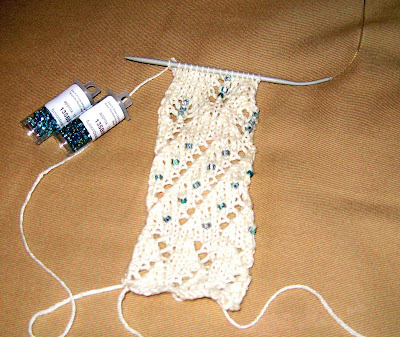 Since I'm getting a little tired of doing the same pattern over and over, I'm going to mix it up a little bit this time. 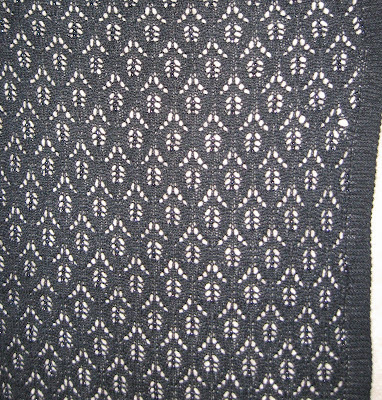 I'll use the leaf pattern at the edges and diagonal eyelet pattern for the main body of the shawl. So I've moved past the neck of the linen stitch pullover - meaning I've cast on to close up the neck again, and once I get back down to just the back, I'll take another picture. 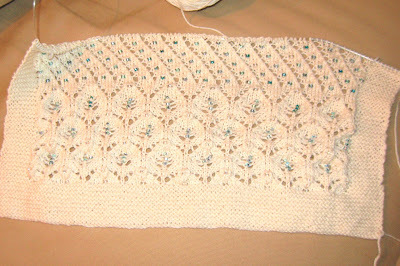 I have this idea for small knit messenger bags - using the linen stitch again for strength and stability - in wool. Maybe I'll play with that. 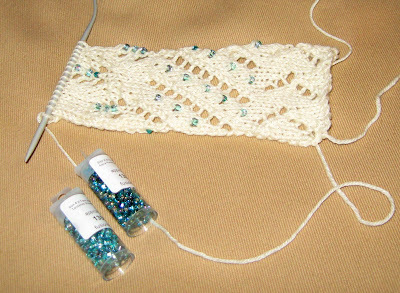 Or maybe this should be where I learn to crochet. (I can hear Yarn or Death laughing as I type this.) Something maybe 10" by 12" with a should strap? I'll maybe play with that. So, I hear that yarn I made for my sister in law has become a sweater! I'm hoping for a picture . . . Happy nine year anniversary, hon. It would be nice if we could spend it hiking in the Whites, but it sure beats not celebrating 9 years. Trust me, here . . . These two plied together - sort of soft and misty looking. Like a foggy mountain-side. Maybe it's something you have to see. In my head, I'm picturing Mt. Chocorua on a misty late Sept. or early Oct. day. Not really junk food I suppose, but I got onto a wristers kick. This started off innocently enough using up the black acrylic for the little one's costume, but then it turned into using up this ball, and now, look, I have some leftover acrylic wool blend from last winter . . . 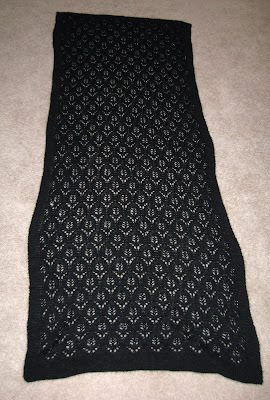 The linen stitch is still coming along, and once that's a bit closer to done, the stars are getting dug back out. Oh, and I have an idea for that left over fleece and some old t-shirts, but we'll see if that comes to anything. Sewing and me, not such good friends. So, the Iron Matrix is done. I did a better job of blocking than you might think from these pictures, I just chucked the poor thing down on the floor to take it's picture. 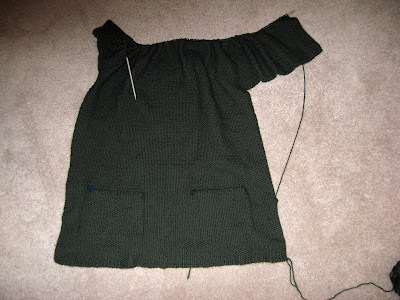 And here's the linen stitch pull over. Next row, I cast off for the neck.